It’s a big birthday for the Emmy Awards as it reaches its 70th year. The award show will take place on Monday, September 17th in the Microsoft Theater in downtown Miami, and will air at 8pm EST / 5PM PST. With funnymen Michael Che and Colin Jost hosting, it’s sure to be a laugh a minute. The good news is you can catch all the action live online and for free from anywhere. In this post, we’ll explain how you can watch the 2018 Emmy Awards live online from the US, the UK, Canada, Australia, Japan, Germany, France, and anywhere else abroad by live streaming the whole event free. The Emmy Awards are airing on just a few select channels, such as NBC in the US and CTV in Canada. While some broadcasters stream their content live online, they restrict access to users located in the source country. However, by using a Virtual Private Network (VPN), you can bypass these restrictions. We’ll explain how this works and recommend some of the best VPNs for watching the 2018 Emmy Awards. A VPN encrypts all of your internet traffic and tunnels it through an intermediary server in the location of your choice. The encryption component keeps your information safe from snoopers (including your ISP, government agencies, and cybercriminals). Tunneling through an intermediary server means your IP address is masked and replaced with one from your location choice. This enables you to bypass those geo-restrictions set by services such as NBC and CTV, as well as other popular sites like Netflix, Hulu, and BBC iPlayer. Select a VPN provider from our list below (we recommend ExpressVPN) and submit payment. Make a note of your new credentials. Launch the app and enter your new credentials. Select a server in the country that your streaming source originates from. Access the live stream of the Emmy Awards and enjoy! While you should be able to watch with no issue, it’s definitely worth doing a test run prior to awards night. While you’ll likely find highlights of the award show on various channels, only a few broadcasters will be showing the Emmy Awards in their entirety. To watch their live streams, some channels will require that you log in with credentials, either for that particular channel or for a cable service. If you have a subscription and are traveling abroad, however, you may be blocked. In this case, you can access the stream using a VPN (with the steps outlined above). We’ll go into the streaming options for various countries in more detail, but first, we’ll look at the best VPNs for watching the Emmy Awards. ExpressVPN tops our list as the best VPN for watching the Emmy Awards for a multitude of reasons. Known for its unblocking capabilities, this provider boasts a large network of optimized high-speed servers, and can help you reliably stream from a host of sources. You’ll be able to enjoy the entire Emmy Awards show with zero buffering while knowing that your connection is secure. ExpressVPN can also unblock Netflix, HBO, Amazon Prime Video, BBC iPlayer, and more. If you do run into issues with streaming or anything else, ExpressVPN’s 24/7 live chat support team is always available to help. This service keeps your connection secure at all times with 256-bit encryption, perfect forward secrecy, a built-in kill switch, and DNS leak protection. ExpressVPN keeps very minimal logs and will never record your IP address. Plans allow for up to three simultaneous connections. Apps are available for Windows, Linux, MacOS, iOS, and Android. The VPN can be manually configured with some routers. READER EXCLUSIVE: If you opt for an annual ExpressVPN plan, you’ll enjoy three months for free. With a 30-day money-back guarantee, there’s no risk. Read our full report on ExpressVPN. NordVPN is another top-notch provider known for its streaming capabilities. It has a huge network of more than 4,500 servers, with many optimized for streaming HD content. The service can get you access to NBC and other channels to watch the Emmys from abroad, and can unblock other services such as Netflix, BBC iPlayer, Hulu, and Amazon Prime Video. Other servers are optimized for various purposes such as double VPN and Tor over VPN. As you can tell, NordVPN is dedicated to providing users the security and privacy they desire. It boasts 256-bit encryption with perfect forward secrecy, and DNS leak protection and a kill switch will ensure your information stays safely inside the encrypted tunnel. A recently added perk is automatic wifi protection which is very handy for on-the-go users. NordVPN doesn’t keep any logs whatsoever. This service is easy to set up and plans include apps for Windows, MacOS, iOS, and Android. It can be manually configured with Linux and some routers. A basic plan enables users to connect up to six devices simultaneously. SAVE 77%: NordVPN’s most economical plan is its three-year deal. You’ll save 77% and pay only $2.75 per month. Discover everything you need to know about NordVPN in our full review. CyberGhost has been making some big improvements over the last year. Its fast-growing network now comprises more than 2,500 serves and the company puts a large focus on enabling users to unblock popular streaming services. It has a dedicated “Streaming Mode” in which you can choose your desired channel and automatically be connected to the appropriate server. Options include Netflix, BBC iPlayer, and Amazon Prime Video. CyberGhost lives up to standards on the privacy and security front with 256-bit encryption and perfect forward secrecy. Automatic wifi protection can be applied to familiar networks, and a kill switch and DNS leak protection are built in. CyberGhost is nudging ahead of its some of its competition when it comes to the number of simultaneous connection allowed and is now enabling users to connect seven devices at a time. Apps can be downloaded for Windows, MacOS, iOS, and Android. Linux and some routers can be manually configured. SPECIAL DEAL: Enjoy savings of 77% on a one-year CyberGhost plan. Find out more about CyberGhost in our in-depth review. IPVanish pegs some of the fastest speeds we’ve seen and makes for a reliable and secure streaming service unblocker. It will give you access to NBC, Hulu, CBS, and more. With more than 1,000 servers dotted around the globe, you’re sure to find one that meets your needs. This service is particularly popular with torrenters and Kodi users. Encryption is military-grade and comes with perfect forward secrecy. You get a built-in kill switch and DNS leak protection, and no logs are maintained. IPVanish is very generous with its device limit and allows users a whopping 10 connections at a time. Desktop clients are available for Windows and MacOS, and mobile apps can be downloaded for iOS and Android. SAVE 60%: Our readers can save up to 60% on an IPVanish plan. PrivateVPN is a fairly young and small provider. While it has far fewer servers than many of its competitors, it still manages to deliver pretty stellar service. It’s renowned for being able to unblock streaming sites like Netflix, Hulu, BBC iPlayer, Amazon Prime Video, among others. Really, this service has everything you need: it’s fast, reliable, and secure. On the lattermost front, it stacks up to the big boys with 256-bit encryption and perfect forward secrecy and doesn’t skimp on additional measures like DNS leak protection and a kill switch. And with “private” in the name, as expected, the service will never log your personal information. PrivateVPN desktop clients are available for Windows and MacOS, and mobile versions are provided for Android and iOS. Router configuration and use with Linux are both possible. READER SPECIAL: Sign up for a one-year term to get five months free plus more than 70% off. Check out our in-depth review of PrivateVPN. We briefly mentioned earlier where you can go to stream the Emmy Awards, but here we’ll look at your options in a bit more detail. In the US, NBC will be showing the complete awards ceremony on TV and via an online live stream. To access the online option, you’ll be asked to sign in using credentials from a TV provider such as Xfinity, Dish, or DirecTV. While there is a long list of options, if you don’t have a subscription, then you won’t be able to watch. If you have TV provider credentials but you’re traveling outside the US and trying to access the NBC live stream, you’ll likely get an error message: “Live stream unavailable in your area.” The best way around this is to use a VPN (using the steps above) to get a US IP address. Then you’ll be able to enter your TV provider credentials as normal. Another way to access NBC is through an IPTV provider such as Hulu’s Live TV, Sling TV, or PS Vue. Even with these services, geo-restrictions will come into play, so you’ll need to use a VPN if you’re outside the US. 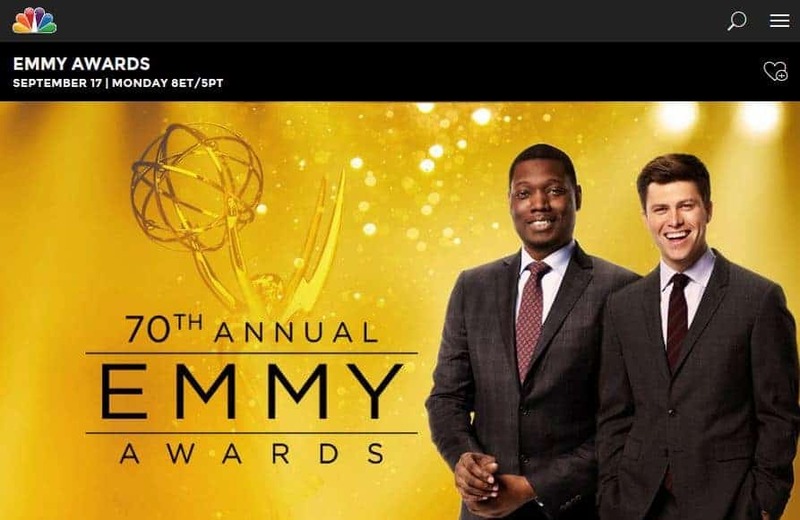 Viewers in Canada can watch the Emmy Awards on TV or via an online stream through CTV. To access the live stream, TV service provider credentials are required. For Canadian residents traveling outside Canada, you can access the stream by using a VPN to get a Canadian IP address. In Australia, the awards will be aired live on Foxtel’s FOX8 channel and online via Foxtel Now. Foxtel Now is a paid subscription service but offers a free two-week trial. Although, you’ll have to submit payment details, so just make sure you cancel before your card gets charged. To sign up from outside Australia, you just need an Australian IP address. Who’s up for nomination in the 2018 Emmy Awards?